Most don’t realize it but the current trend is the third time that “cloud computing” has achieved preeminence, having failed twice before. I recall in the early nineties, just when I was starting to use brand new Windows NT at my first job, DEC had gone broke, and Unix (not Linux) was THE standard for distributed computing, I came across an odd, old book from 1966 that was being discarded by the library: The Challenge of the Computer Utility by Douglas F. Parkhill. I hesitated taking it home; it did not fit anything I know about computing. However this short book was fascinating. It talked about computing power as similar to electricity or water, something that could be shared and channeled to be used by millions, and the economics behind it. I kept the book, feeling it that the technology behind was already three decades old, but that the economics part of it seemed still relevant. Only in the early 2010’s, with the coming of Cloud Computing was that I finally became aware of the importance of that book as I got more and more into a new thing called Azure and Amazon clouds. A funny fact is that the book itself has a short history of computing in the first four chapters (chapter four: “Early Computing Utilities”), and only on chapter five goes on to latest state of the art on Time Sharing Systems. Chapter Six is on the economics aspect of computing utilities, which pretty much is visionary in anticipating all that is going on now with AWS and Azure evolving pricing models. 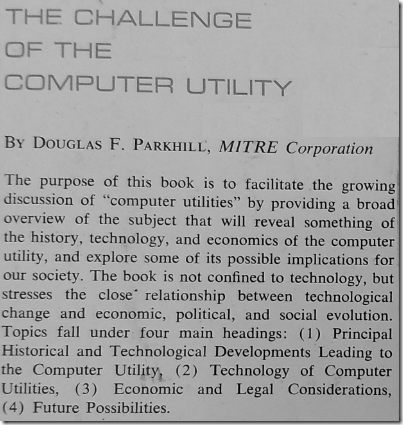 Despite the optimism of Parkhill and others, the concept of a public computing utility was still at its infancy considering the technical complexity of the problem. It continued to evolve as private time-sharing systems, with DEC/ UNIX systems accelerating in the 70’s and becoming mainstream in the 80’s. The second overlapping wave came by capitalizing on technical advancements as a foundation to evolve the economics of utility computing. Perot, with EDS, was one of the early proponents about selling computer time, not hardware to customers. He took the lead in the 60’s, and by the early 90’s the outsourcing industry had become a complex services segment of IT, with hundreds of companies that would not only sell computer time but also take over your IT services as a whole. It became a mantra of the day to focus on core business and outsource all non-core business functions to these service bureaus, as they sometimes had been called since early days. That meant sharing not only computing infrastructure with other businesses, but also services as well. Most of these services were initially mainframe based, such as IBM’s or Unisys’. IBM itself was a big provider of this kind of integrated IT service, and was not sitting on its laurels with just mainframe shared services, having branched to embrace the PC revolution it helped start. It was Gerstner’s major success and turned the company around. All this focus on core services might have been a consequence of an initial well intended reengineering idea, but it ended up being pricey due to pretty much lock-in and lack of competition. The lowering of computing hardware prices brought by ruthless commoditization by Compaq and Dell was so much in full swing, that circa ‘98 I recall working with company after company in migrations from service bureaus to in-house client server systems. Still, it would seem in around 1999 that the “computing utility” world was for IBM and HP to share, and the typical view of the world was as a customer plugged into the Matrix mainframe. In the meantime, the technology continued to evolve with rapid progresses in virtualization (as shown by the stellar rise of VMware as the de facto standard) in late 90’s, clustering, and distributed computing (culminating with the Internet). Most companies opted for in-house farms of inexpensive servers with virtualization software such as VMWare. The advent of Linux replacing all things UNIX, and the Xen hypervisor set the stage for the displacement of all previous contenders (IBM, HP and Sun) for the arrival of AWS. How a company that had started selling books online ten years before had become the major proponent of selling computing utility (now being called everywhere “public Cloud” services) is a fascinating topic in itself. However it was not without precedent: the infamous Enron company had already in its target “to trade bandwidth like it traded oil, gas, electricity, etc”. Amazon pretty much made use of its already existing ability to sell anything, to sell one more thing: excess capacity of its data centers. All this effort has paid off to Amazon and Microsoft Why is this third time a charm? It is because by 2008, all technological components were in place to provide reliable public computing utility services. From Pfister’s book (originally on clusters, but those are the technical foundations of high availability), here are the standard technical reasons why you want it: performance, availability, price/performance ratio, ability to grow incrementally, scaling. According to Pfister, there is also the “scavenging of unused computing cycles” as a reason to why you want computing clusters, and therefore, the Cloud. On top of the technical platform, Amazon also had the logistics and economics patterns figured out, and now so do the other providers. The Cloud also summarizes and commoditizes all the best implementation patterns around, from software design ones, to architectural, and its own cloud computing patterns. It is a massive collation and redistribution of knowledge, and in this foundation relies its stability. Public computing utilities are here to stay. Cloud Computing has now finally a chance to fulfill its potential environed at MIT in the early 60’s. Many "scaling agile" efforts have failed for lack of focus on delivering working software on a regular basis. They have instead just been a refactoring of processes to gather requirements. It is easy to ignore tooling, development, and down–to–the metal DevOps practices when talking about scaling agile. However, these can be a boon or a bane to achieve working software – meaning tested software – and as with any process implementation, agile at scale is no different. Knowledge management is often touted as one of the major applications of SharePoint and similar tools that made them widely successful. Oddly, the shoemaker's children go barefoot. Companies lose millions every year because of their inability to actively manage the intellectual capital invested in the applications they develop. VSTS lets you take control of this situation by using it as your team's communication hub and expanding it with practices and strategies to truly manage the knowledge supporting your applications. The conference is from April 30th to May 4th at the Hyatt Regency. I don’t yet have the schedule of when I will be presenting, so I will update this post when I know it. You can register at https://vslive.com/events/austin-2018/home.aspx. 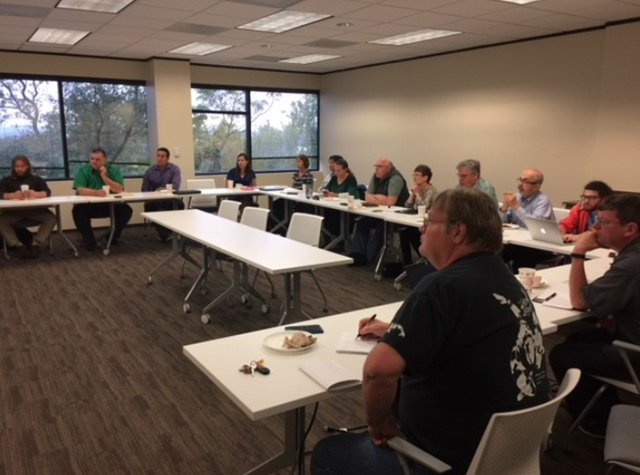 As MVPs, we participate of meetings with Microsoft to provide feedback or to learn about some upcoming new product delivery. This is one of the finest opportunities of being an MVP: to be at the cutting edge of Microsoft technologies. In October there was an internal MVP meeting with Microsoft on DevOps with Azure. Without going into the specifics, which are under NDA, I want to bring that this one caught me by surprise. When I got the invite, I only looked at the meeting title “Azure DevOps OSS + Q&A with Arun Chandrasekhar”, and took for granted it was about OSS VSTS integrations with Azure: nothing new for me as I have been doing this for while. However I was blown away by Arun’s presentation: it was about how to do DevOps with OSS tooling, especially Jenkins and Terraform. At my previous job I had worked extensively with Jenkins, including being able to be one of the architects of a build infrastructure that ended up being used by a couple thousand developers. Given my previous interest and work with Jenkins I will be learning a lot after delving into those references. In conclusion: it’s always good when something forces you to step out of your comfort zone, and meeting Arun has definitely been a great opportunity. From the last few posts you might have noticed that I have been following up on the DevOps FastTrack offering, and the training that was provided by Microsoft on September, and how valuable that has been for me in understanding how a cutting-edge DevOps practice can be. The VSTS team in that regard is as cutting edge as Facebook’s, Google’s or Netflix. They are not bound to adopting practices such as SAFe (that was a question asked in one of the talks); rather they are defining their own because they are at a place where they are the pioneers (not the individual practices, but their use at scale). They are operating at the Ri level, they are transcending what is currently known. It was a stated purpose that we as MVPs and Microsoft partners should share these presentations with our customers. I started doing that with every engagement since then, always starting the summary one made by Lori Lamkin. Now the great surprise: Sam Guckenheimer has worked with the team that presented in extracting any NDA references, and has now shared the whole set of talks at DevOps at Microsoft. This is a treasure trove on how to to do DevOps with VSTS and beyond. I am organizing sessions at our company (Nebbia) so we can watch it together and use it as inspiration for next steps on our own DevOps journey. You might remember that I attended the DevOps Fast Track training last month. So I jumped at the opportunity of bringing some of this content to the Agile-at-Scale User Group of which I am a co-lead with Leland Newsom. This month’s topic will be on the Microsoft Agile transformation his team went from circa 2009 and still goes on until today. 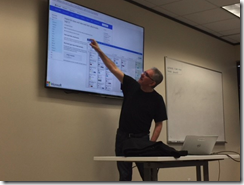 At the DevOps Fast Track summit it was my favorite talk, and I will revisit the topic to also bring my experience as Microsoft TFS product team member, and how it contrasts with today’s new dynamics. Microsoft went from having a cycle of 18 months between releases, to almost daily releases of VSTS. Let’s examine the inside story of this extraordinary Agile transformation, and what lessons we can take from it. You can register for the meeting at https://www.meetup.com/AgileAustin/events/243893417/.